My name is Aisling McCarron. I am 18 years old and I volunteer with Children in Crossfire. 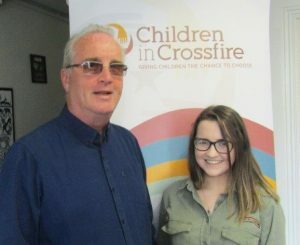 I first became involved with Children in Crossfire in March of 2017. I had to complete one week of work experience for school and wanted to do something worthwhile. I have a big interest in human rights and in helping those who are particularly vulnerable in developing countries. I am considering pursuing a career in this area so I decided to reach out to Children in Crossfire and see if they would take me in for the week. I choose to volunteer with Children in Crossfire because I felt the work they do is so important and impactful. They carry out lifesaving work in Tanzania and Ethiopia, helping vulnerable children and families by setting up sustainable projects, providing lifesaving treatment, as well as setting up education programmes. When I contacted Children in Crossfire, I received a prompt response and was welcomed in straight away. They immediately made me feel at ease, everyone was so kind and I couldn’t have received a warmer welcome. My week flew by and I was genuinely sorry it had come to an end. Since then I have kept in contact and have helped at various events and at times when things were a bit busy in the office. I have returned again to complete another week of work experience and plan on helping when I can throughout the summer. Through my work in Children in Crossfire I have gained a lot of experience across the board. I have visited schools, spoken in my parish during the Advent Appeal and helped at events such as the Colour Run and street collections. I have also helped with data work, put up posters, visited primary schools during Fairtrade week and helped to promote Fairtrade, as well as helping in the office as there is always plenty to be done. My work so far with Children in Crossfire has been an incredibly worthwhile experience. It is a brilliant feeling to know I have made a contribution to the fantastic work being done in Tanzania and Ethiopia. Richard and the team have made me feel welcome and appreciated since day one. I plan to continue to volunteer and cannot stress what a genuine, worthy cause this is and would encourage anyone to do the same.